Calm and clear start to November in Dublin 16. 2.0c atm. -2.4c in North Kildare. Clear sky with beautiful ground hugging (graveyard style) mist in the fields. Clear and sunny in Dublin 16. 5.5c atm. Overnight low of 1.6c. Bright and sunny now here near Tralee , 8.5C short time ago. Picking up some big showers since yesterday evening, shower 30 mins ago, 5mm since midnight. Clear and calm in Dublin 16. 5.6c atm. High of 9.5c today. 9pm Castlebar. 3 degrees,Calm,Clear skies. 1015hpa. 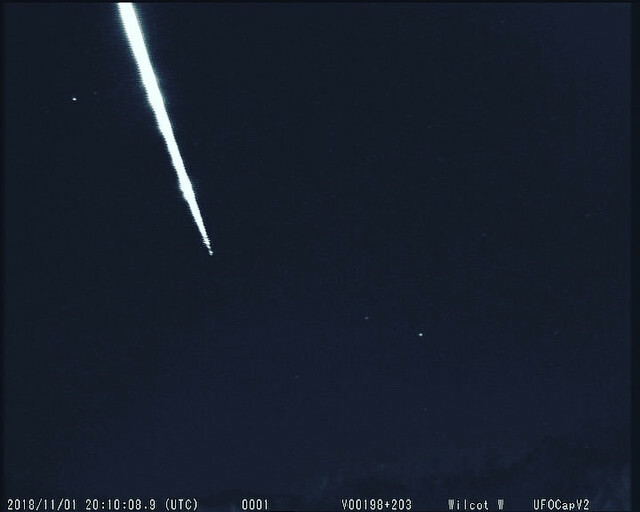 Anyone see the Fireball tonight? I saw it on the coast of Achill headed North. There were sightings all over England, and Northern Ireland. No word from astronomy irl on Twitter yet. Clear morning in Dublin 16, with a light breeze. 0.6c atm (also being overnight low so far). 4.3c, r/h 94%, 1022 hPa. Overcast, calm, chilly.